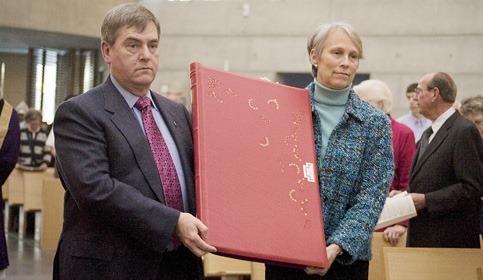 Most expensive Bible in print: Saint John’s Heritage Edition? The Bible needs to be in print – or have been in print recently. No fair nominating Guggenheim Bibles (that would put the price in $25 million range). The Bible should be printed – not hand written. The Bible should be produced in multiple copies – not just a single unique copy. 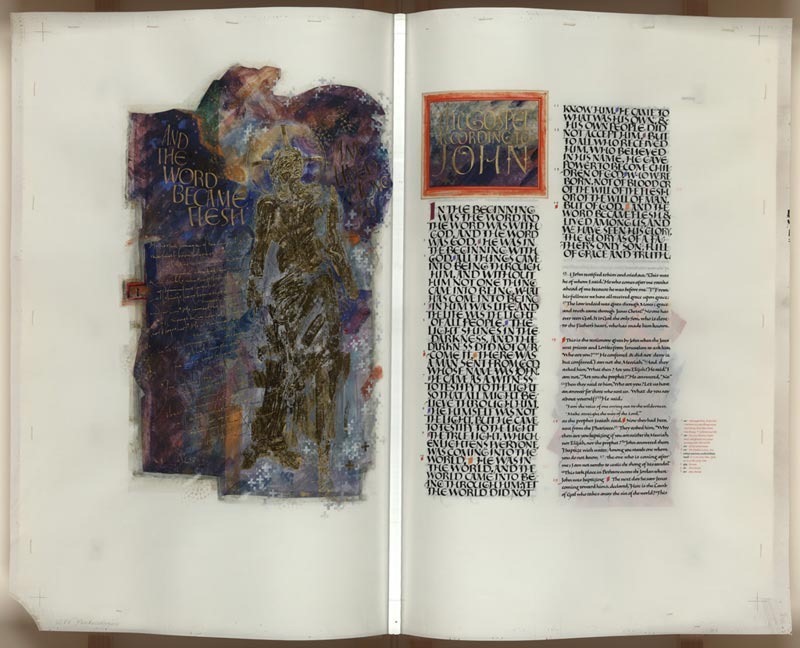 Now, given these constraints, perhaps the most expensive Bible in English is the Saint John’s Bible Heritage edition – which costs a cool $145,000. 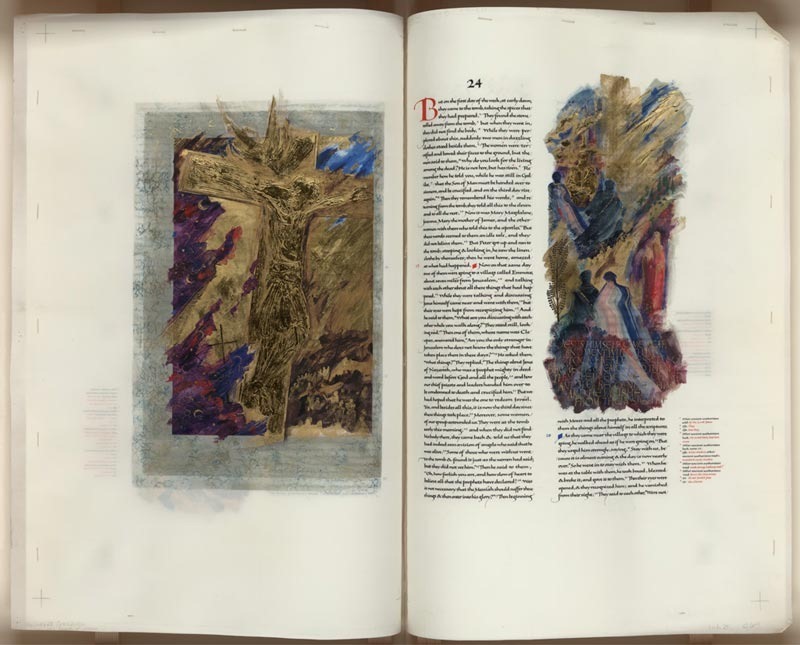 These are reproductions of a handwritten, illuminated Bible (NRSV) made under the direction of Donald Jackson by a group of calligraphers, illuminators, and Benedictine monks. 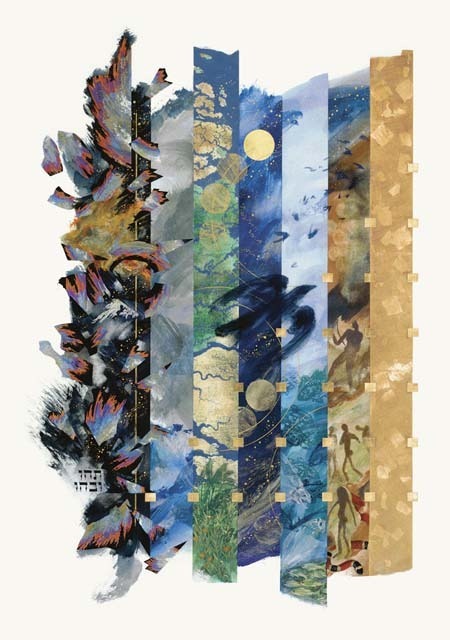 Creation: The structure of this illumination reflects the seven-day progression of the Bible’s Creation story, with seven vertical strips, one for each day. On the first day, fragmented shapes explode from the primordial void, expressed by the Hebrew words “tohu wabohu” (chaos). A vertical gold line marks the moment in the story when God ordered, “Let there be light.” Day three contains satellite pictures of the Nile Delta, suggesting the division of land and water and the beginnings of vegetation. The creation of human beings on the sixth day is represented by images from aboriginal rock paintings in Africa and Australia. The snake implies dangers to come, in the Garden of Eden. The golden seventh day is given over entirely to the contemplation of the spirit. The raven flying across the composition is the traditional carrier of God’s message to Saint Benedict. Adam and Eve: Adam and Eve are presented as an African man and woman surrounded by patterned fabrics from various ancient cultures. Photographs of Ethiopian tribes-people influenced Jackson’s design. He wanted to link the notion of the Bible’s first man and woman with current archaeological and anthropological theories that humankind originated in Africa. The decorative framing around Adam and Eve includes African tapestry patterns and, on the right, a Peruvian feather cape. The horizontal stripes are details of Middle Eastern textiles and of white body painting on black skin. The poisonous coral snake, also depicted in the Creation and Garden of Eden illuminations, appears between Adam and Eve. Jackson’s use of a gold bar framing Adam and Eve is meant to suggest God’s presence as a framework for human life. Jacob’s Ladder: This image evokes the surreal wonder of Jacob’s dream about angels ascending and descending a ladder that reached from earth to heaven. According to the Bible, in that moment when heaven and earth were briefly joined, Jacob realized his special relationship with God. Accompanying the abstract gold angels are fragments of realistic butterfly wings. They echo the angels’ wings, becoming an earthly analogy for angels and also a metaphor for the fleeting nature of Jacob’s vision. The butterflies appear against a lacy pattern of gold, a gossamer presence. The quotation along the bottom, which can be linked with words from the preceding verse — “Surely God is in this place” — refers to Jacob’s powerful and moving experience. 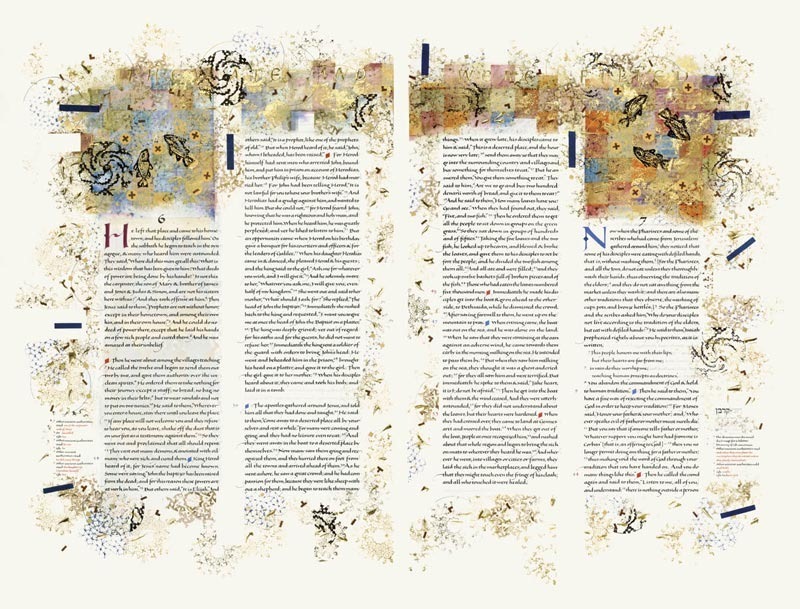 The Ten Commandments: The theological brief from the Committee on Illumination and Text required the artist to combine five different passages from Exodus into a single illumination. Since the committee’s brief also suggested that the giving of the Ten Commandments represented a new creation, they were chosen to create the principal image around which to group the others. Depicted along the top of the composition are the burning bush, the first Passover, the crossing of the Red Sea, and the twelve pillars, representing the twelve tribes of Israel, erected at the foot of Mount Sinai. 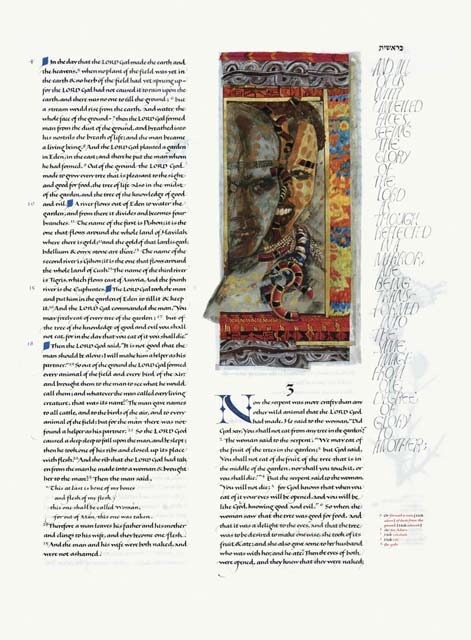 The lower half of the page contains the Ten Commandments, overlapping and dissolving the colored background. Instead of writing the words, the artist stenciled them, using the typeface Stone Sans to emphasize the authoritarian nature of God’s words. Moses is shown with fragments of the tablets of the Ten Commandments and a prayer shawl patterned after a traditional Middle Eastern design. Mount Nebo is depicted in the background. According to the Bible, God led Moses to the top of Mount Nebo, from where he could see the Promised Land. However, Moses was not allowed to enter the Promised Land because of a momentary lack of trust in God. He died on the mountain. Matthew Frontispiece: The Gospel of Matthew begins with the genealogy of Christ. Reaching back into the Old Testament scriptures to Abraham, progenitor of the Hebrew nation, Matthew lists the names of succeeding generations, culminating in the birth of Christ. 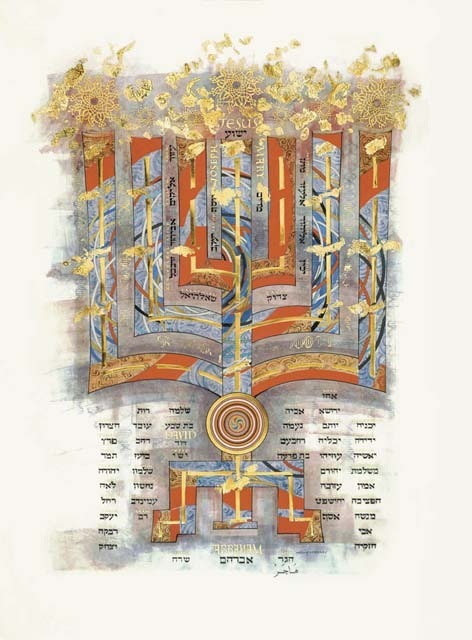 This illumination is a family tree structured as both a tree of life and a menorah, the Jewish seven-branched candelabra. Placed at the beginning of the first gospel, the menorah serves as a bridge between the Old and New Testaments. A mandala-like cosmic image near the base is common to several religions and implies the universality of the search for a supreme being. The intricate gold medallions above the menorah were inspired by illuminations from the Koran. Reflecting our own time, patterns of DNA double helixes between the outer branches emphasize the connectedness of all humanity. The ancestral names flank the base of the menorah/tree and climb between the innermost branches. Abraham’s name appears in English and Hebrew, with that of his wife, Sarah, from whom these generations arose. Named in both Arabic and English is Hagar, Sarah’s handmaiden, with whom Abraham fathered Ishmael, the ancestor of the prophet Muhammad, founder of Islam. At the very top is the name of Jesus, in the same lettering style as Abraham, David, Mary, and Joseph. Beatitudes: The letters of the word “blessed” are scattered randomly in a multicolored pattern, here and there reuniting to form the word. The overall effect recalls mosaic decoration, a traditional artistic medium dating to pre-classical times in the Near East. Monarch Butterflies: The margins of medieval Bibles were often decorated with plants and animals that had symbolic meanings. In Christian art the butterfly symbolizes resurrection. The three stages of its life–caterpillar, chrysalis, and butterfly– correspond to life, death, and resurrection. 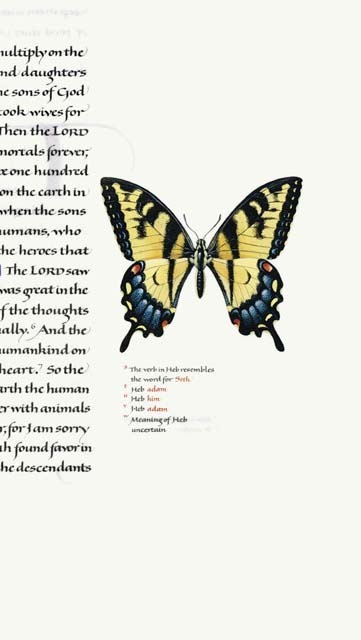 In The Saint John’s Bible, all the species of flora and fauna depicted in the margins are native to the Minnesota woods surrounding Saint John’s University or to the Welsh countryside near Donald Jackson’s home. 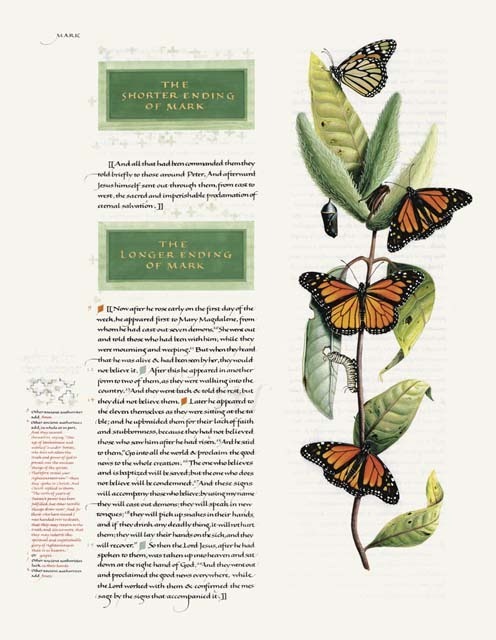 Chris Tomlin, a specialist in botanical and nature illustration, came to Minnesota to research subjects for marginalia, and these monarch butterflies help root this Bible in the community of Saint John’s Abbey and University in Minnesota. 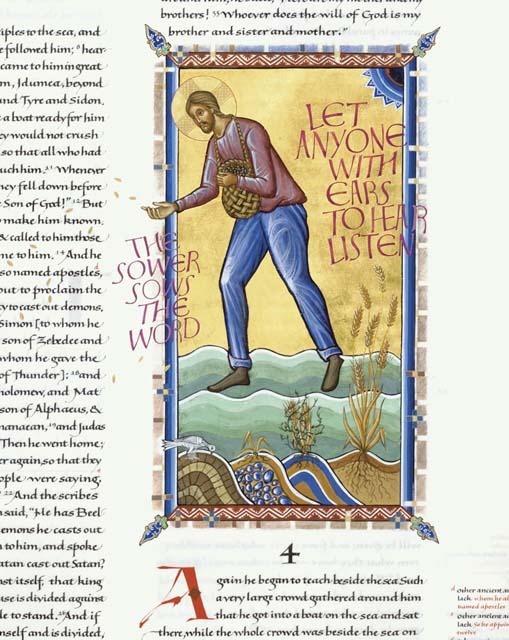 The Parable of the Sower and the Seed (Mark 4:3-9): In this icon-like image, the sower’s halo, with its cross, identifies the figure as Christ sowing the word of God. His contemporary Western work clothes indicate that this image is a metaphor, in which the sacred message is revealed through a mundane action. The four small hills along the bottom signify the four kinds of soil on which the sower’s seed falls. According to the Bible parable, the hard path, where the seed cannot take root and is eaten by birds, signifies the closed mind that refuses to hear God’s word. The rocky ground, where the sprout is short-lived, represents shallow people who accept the word of God but do not let it take root in their inner being and fall away when they are persecuted. The thorny ground corresponds to people who understand God’s word but let material things choke their spiritual belief. The good soil, where the wheat has taken root and thrives, represents those who act upon the word of God and share it with others. The Multiplication of the Loaves and Fishes (Mark 6:30-44, 8:1-10): In the Gospel of Mark he narrates twice the story of Christ providing food for multitudes of people, probably giving two versions of the same event. This illumination accompanies the first version, in which Christ miraculously multiplied five loaves and two fishes to feed five thousand people, with twelve baskets of leftovers. Tradition locates this event at Tabgha, on the west side of the Sea of Galilee. In this image, the stamped images of fish derive from a mosaic in Tabgha and the circular loaves, marked with a cross, prefigure the bread of the Eucharist (Communion). The baskets (shown partially) have geometric designs based on ancient Native American Anasazi basketry, acknowledging the American origin of this Bible and the coexistence of other beliefs. 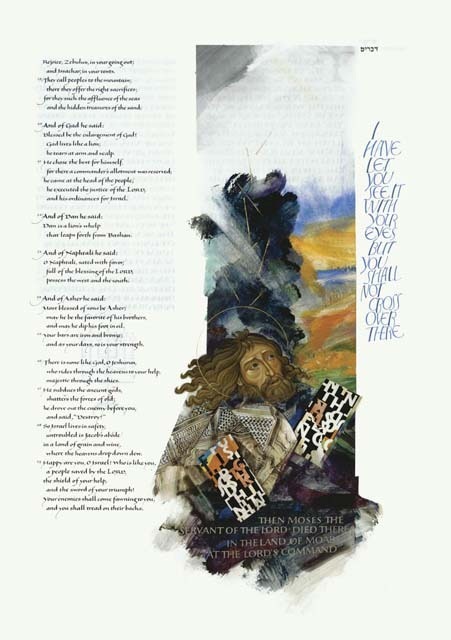 Luke Anthology: In this image five parables and one story unique to the Gospel of Luke are illustrated in diagonal bands that read in descending order from left to right. The three “parables of the lost” are about God seeking and finding lost sinners. The image of Christ at the top right figures in all the scenes. Parable of the Lost Coin (15:8-10): Scattered coins represent the boundless joy of a woman who has turned her house upside down to find her lost coin. Parable of the Lost Sheep (15:4-7): A bedraggled sheep, alone in the dark, looks toward the golden light streaming from Christ and his angels, which promises rescue and return to the fold. Parable of the Good Samaritan (10:29-37): Quotations from the text spell out the triumph of love over sectarianism and over adherence to doctrine at the expense of compassion. Parable of the Lost Son (15:11-32): The erring son leaves the pigs he has tended and returns to his father, who runs to meet him and forgive him. The twin towers of the World Trade Center point to the need for forgiveness in our time and for seeking alternatives to revenge. Parable of Dives and Lazarus (16:19-31): Dives (“wealthy one”) feasted while Lazarus begged at his door. The scene shows them after death, separated by a chasm: Lazarus, carried by angels, rests with Abraham, while Dives suffers the fiery torments of hell. Martha and Mary (10:38-42): The sisters look toward Jesus, who approved Mary’s listening to his teaching and rebuked Martha’s unneeded acts of hospitality. The Crucifixion (Luke 23:44-49): Rendered in raised and burnished gold, the crucified figure of Christ dominates this composition. Luke’s Gospel recounts that upon Christ’s death darkness covered the earth for three hours, indicated here by the night sky, and that the curtain of the temple, shown as shreds of purple, was torn in two. The contrast of pain with the glory of gold relates this image to current theological discussions concerning the meaning of the Crucifixion in the contemporary world. The delicate gray border was printed with English lace, contributing to the recurring theme of textiles in The Saint John’s Bible illuminations. 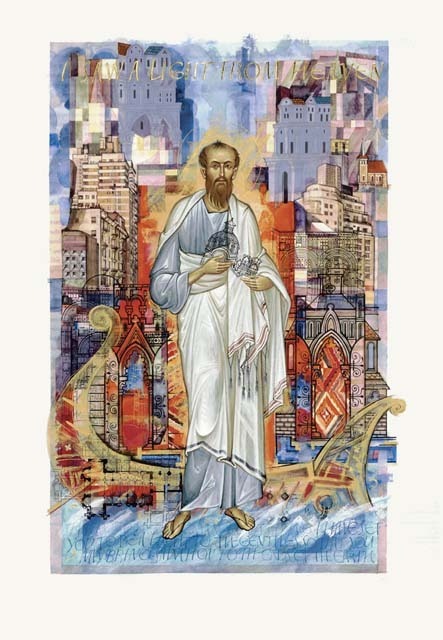 John Frontispiece: The Word Made Flesh (John 1:1-14): Stepping out of darkness, which alludes to the chaos that precedes Creation in the Bible, the golden figure of Christ brings light and order. Words in golden script, from Colossians 1:15-20, link the figure of Christ with the words “And lived among us” at the upper right. A keyhole jutting into the left margin recalls the tradition of locked and hinged manuscripts in securing, protecting, and holding the “key” to the Word of God. The Life of Paul (Acts): Paul was the apostle to the Gentiles, and he traveled as a missionary throughout the Near East. He is posed here in the manner of classical Greek statues. A prayer shawl draped over his shoulders indicates his upbringing as a devout Jew. Surrounding him are secular and sacred buildings from nearly every historical period of the last two thousand years. Because he made several sea voyages and was once shipwrecked, Paul stands before a Greco-Roman sailing vessel. An energetic church builder, he holds a model of a church that recalls Saint Peter’s Basilica in Rome, the city where he was martyred under the emperor Nero. The words at the top, “I saw a light from heaven” (26:13), refer to Paul’s conversion to Christianity. Those across the bottom proclaim his divine mission: “The Lord has commanded us, saying, ‘I have set you to be a light for the Gentiles, so that you may bring salvation to the ends of the earth’ ” (13:47). Luke frontispiece: The Birth of Christ (Luke 2:1-20): Gold is used throughout The Saint John’s Bible to indicate the divine. Here a brilliant shaft of light, executed in gold leaf, rises from the child’s crib, making the Christ Child the focal point of this scene, although he is not pictured. His mother, Mary, gazes tenderly on the infant. The shepherds are women and girls, which was probably the case at the time of Christ. Between the viewer and the unseen infant, the animals form a protective barrier. The ox is modeled on one of the Neolithic cave paintings of great aurochs at Lascaux, France. The upper text is the angels’ song. 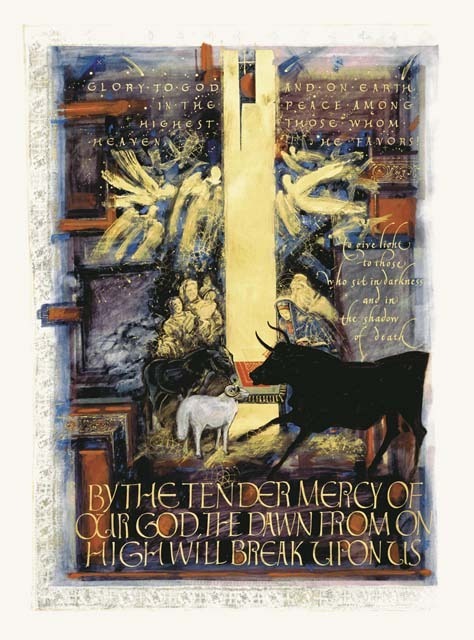 The central text refers to this child’s role as “light to those who sit in darkness,” and the lower text anchors the entire illumination in a metaphor of divine light. Quill Curing: The scribes require quills that are both strong and supple. The best ones come from mature turkeys, swans, and geese. Before they can be used for writing, the quills must be cured, cut, and trimmed. Curing is a hardening process. A studio assistant begins by removing the ends with a quill knife and leaving the quills to soak for twenty-four hours. The next day the assistant takes out the internal membrane and pours warm sand (which has been heated in a frying pan) over each quill while rotating it. When the barrel (shaft) of the quill turns from milky to clear, the sand is removed, and the hardened quills are stored in a jar. Next, the long barbs on one side of the quill are stripped away. A series of three scooping cuts with a quill knife, a slit, and a final trim to the point quickly turn the quill into a responsive writing tool. Now the quill is ready for writing. Vellum Preparation: The skins used in The Saint John’s Bible come from a vellum factory, where they have been prepared to a certain extent. However, a studio assistant must do the final preparation to ensure a perfect writing surface, a job referred to at the scriptorium as “scrutching.” The skins are rubbed down with abrasives to achieve the right texture. First, the skin is placed on a smooth table and rubbed with relatively coarse sandpaper to raise the nap and to work in and flatten the veins, evening the surface. An infinitesimally fine layer of the skin is rasped off. The next step is the addition of gum sandarac, a resin that has been ground with a mortar and pestle and put in a fine-weave linen bag. Dusting the skin with the bag sifts the gum sandarac evenly across the surface. Then, using a finer grade of sandpaper and a circular motion, the assistant rubs down the skin again, stopping often to check the result. As the work proceeds, the assistant rubs ever more gently, until the finish becomes soft and velvety. Graphics Layout: On a computer, the project’s graphic designer/typesetter devises the precise layout of every page. This allows the scribes to work simultaneously, since they know in advance exactly how each page will begin and end. 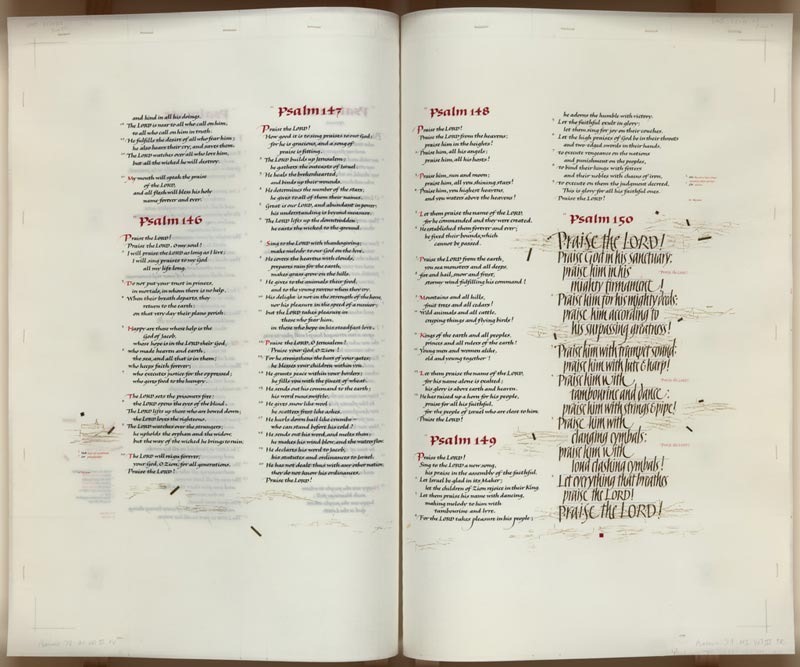 Using a typeface that closely approximates the script Jackson designed for the Bible, the graphic designer/typesetter determines the space for each letter based on raw digital text of the New Revised Standard Version, which follows prescribed guidelines. Paragraphing and spacing between paragraphs are integral parts of the translation, and a special dictionary establishes acceptable word breaks. Printouts are created to be used by the scribes, illuminators, and proofreaders. Ruling Up: When a page of vellum has been prepared, pencil lines are ruled on it for the scribes to follow. A dummy page shows where space should be left for illuminations and how many lines are needed. A line guide placed on the side of the drawing table, with marks for each text and note line, ensures uniform ruling on all the pages. To mark the column widths, a ruling guide is centered on the page and holes the correct distance apart are pricked at the bottom and the top. Vertical pencil lines are then drawn along a metal ruler laid between the holes. Gilding: In every illumination, gold is the first design element placed on the page. Three types of gilding are used in The Saint John’s Bible: powdered gold, acrylic medium, and gesso. Gesso gilding is the most technically demanding and produces the most spectacular result. Gesso usually consists of plaster, white lead, sugar, fish glue, and a bit of powdered color. It is prepared in advance and kept as small dried cakes until needed. The gilder wets the gesso with water and glair, a liquid drained from beaten egg whites. The rather thick gesso is laid on with a quill or a brush. When dry, it is scraped and smoothed with a sharp knife. Then it is covered with gold leaf – incredibly thin sheets of 24-karat gold. On a suede gilder’s cushion, the gold leaf is cut into small pieces, which the gilder applies one at a time with a finger (the skin’s natural oil attracts the gold leaf). Moisture from the gilder’s breath, delivered gently through a bamboo tube, activates the glue in the gesso. When the application is complete, the gold is covered with a silk cloth and burnished. The slightly raised contours, typical of gesso gilding, reflect light and enhance the gold’s effect. Tools and Materials: This selection of tools and materials used by the scribes and illuminators includes hand-carved stamps, antique inks and powdered pigments, a mortar and pestle, quills and brushes, penknives, packets of gold leaf squares, a gilder’s cushion and gilder’s knife, burnishers, practice samples of vellum, and an antique drafting set. 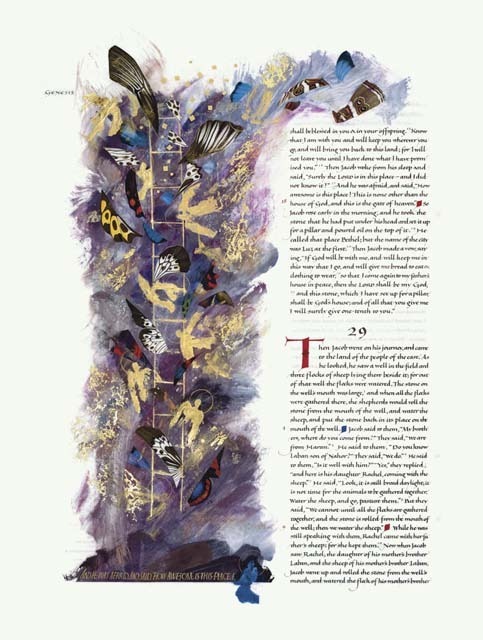 The Heritage Edition of The Saint John’s Bible is a fine art reproduction of the original. Its creation has engaged the finest printing experts and binders to ensure faithful representation of the original manuscript. 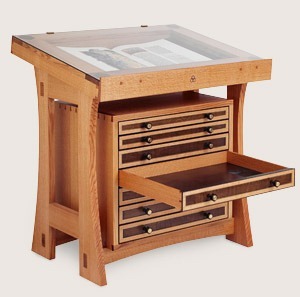 A world-class team of scribes, artists, and craftspeople have guided its development from the ink first touching the vellum to the creation of the Heritage Edition—each of which brilliantly maintains the awe-inspiring artistic intent of the original. Each of the 1,150 pages and 160 illuminations has been scrupulously compared to its original counterpart to guarantee accurate reproduction. Monadnock Paper Mills, a family-owned paper mill in Bennington, New Hampshire, and the oldest continuously operating paper mill in the United States, is supplying the paper for the Heritage Edition of The Saint John’s Bible. It is custom-made of 100 percent cotton with no artificial whiteners or brighteners, coatings or fillers. This archival paper will last for generations. The Benedictines of Saint John’s Abbey, who place a high value on sustainability and reverence for the earth, are also pleased with the ecological awareness of this partner. Monadnock has achieved carbon neutral status and has been actively involved in caring for their near-pristine New Hampshire environment for nearly 50 years. The Heritage Edition’s fidelity with the beauty of the original masterpiece is achieved through multiple techniques. Inks: Fade-resistant, permanent ink is applied through a special printing technique using ultraviolet light. The depth of the images is a testament to the quality of this process. Translucent Effect: The translucent vellum pages of the original make “show-through” an integral part of the artwork. This is recreated on the cotton pages by printing—in reverse—a light watermark of the adjacent page. The search for printing vendors for the Heritage Edition began in 2004. Options were explored in England, Switzerland, Austria and Italy, but ultimately it was three companies in Minnesota who were contracted to do the work. John Roberts Company in Minnesota had been working with color management techniques in digital-to-print technologies and invested in a rare, high-tech Heidelberg XL-105 press. They already had partnerships with ColorMax of Paynesville, just 20 miles from Saint John’s University, that initiated the digital imaging of the original pages. Since then the imaging has moved in-house to the Hill Museum & Manuscript Library. Finally, McIntosh Embossing in Minneapolis provide the silver and gold embellishments. Each volume of the Heritage Edition goes through a rigorous process of color correcting and press checks at every stage. Donald Jackson oversees production, aided by international printing consultant, John Parfitt, Donald Jackson’s studio manager and Sarah Harris. 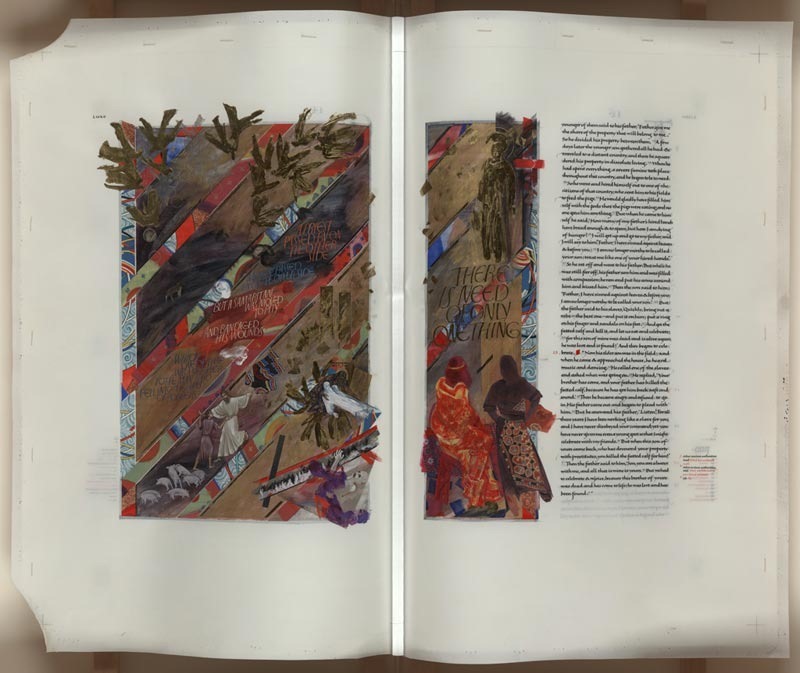 The Heritage Edition of The Saint John’s Bible is being produced in the same seven volumes as the original. Following the intensive printing process, the pages travel to Phoenix, Arizona, for binding at Roswell Bookbinding. The volumes are bound in rich, handcrafted, embossed red leather. The spines are imprinted with the volume title and number in gold foil. Each volume is finished with an ornamental silver clasp. There are a number of copies available on public display across the US and Europe. I’ve seen it, and it is spectacular. The volumes are huge. Not only does this Bible cost $145,000, but even the recommended stand costs $20,000. Now, if that is too much money for you, there is a somewhat less spectacular “standard” version produced in seven volumes by Liturgical Press. 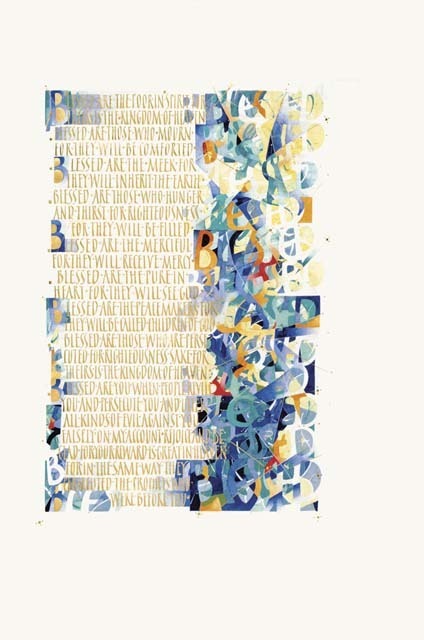 This lovely, accessible edition of The Saint John’s Bible from Liturgical Press offers the complete text and illuminations in a 9 ¾" x 15" hardcover format with dust jackets. 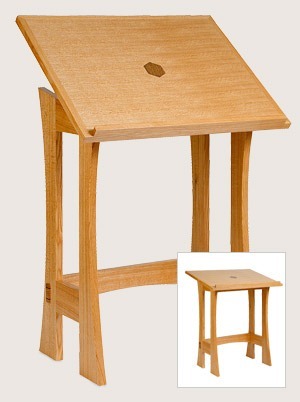 Perfect for exploring the text and illuminations and following the progress of the project. I suspect that for most BLT readers, the Heritage Edition will be something that they can only see in a museum. But given the standard edition is a fine alternative for those who want to explore this impressive work, and far more accessible. Also worth noting are the volumes in the “Art of the Saint Johns Bible” series (volume 1, volume 2, volume 3), a book of “prayers and wisdom,” a “making of” volume, and a making-of DVD. Curious that Benedictine monks would have chosen the NRSV for such a monumental undertaking. A few years ago my family and I saw the Dead Sea Scrolls exhibit when it was in San Diego. 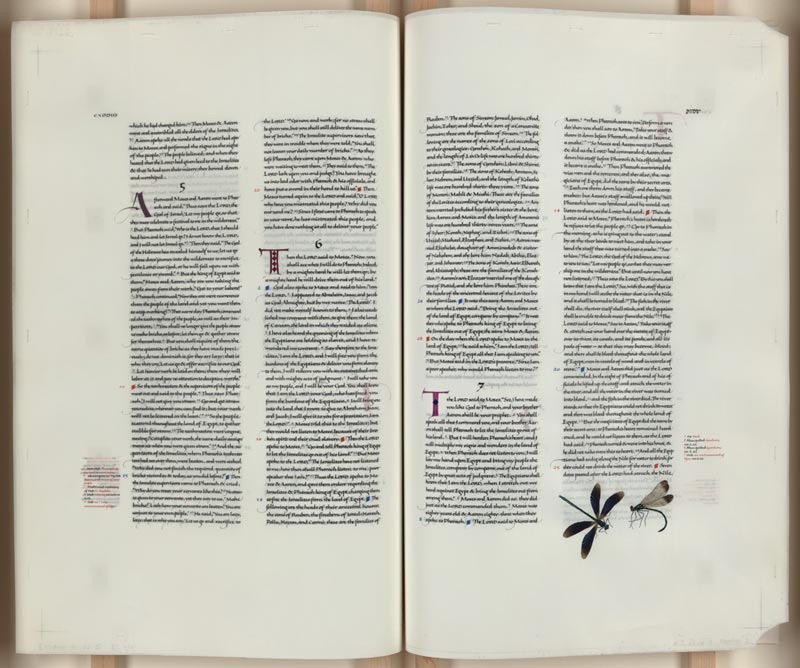 At the end of the DSS displays, there were some printed bibles from the Renaissance era, and a couple of pages from the original St John’s bible, including one of the iconic pieces by Aidan Hart. What splendor, all of it, but I had already begun collecting the mass-produced volumes of the SJB, and to see some of the original was a quite unexpected, awe-inspiring blessing. Dana, I saw it at the San Diego Dead Sea Scrolls exhibit too. Wasn’t that a wonderful exhibit? If you live in San Diego, you can see the Heritage Edition next week, and the original is on display in Santa Fe now. The Heritage Edition can also be viewed in Southern California at Loyola Marymount University and Pepperdine University. I was so happy this year when the SJB was finally complete for purchase in the cheaper mass produced edition. Even though it cannot compare with the experience of seeing the original, I still treasure it. Don’t live in San Diego – daughter went to college there, and we were picking her up on the way to grandparents’ in AZ for Thanksgiving. The Museum in general was impressive. We did live in So Cal for a while, and I miss the cultural opportunities. Have to travel 2 hours to San Francisco now for anything comparable – and I do. Plenty of good stuff there, too. 1) This project is meant to be a product of the 21st Century. Thus a translation with archaic English would be inappropriate. The Douay-Rheims and RSV-CE would necessarily be excluded. (keep in mind the RSV-2CE was published in 2006.) The only other options, really, are the NAB or NRSV. The NAB, itself, was under revision at the time, and to be fair, has never been applauded for its literary style. 2) They wanted an ecumenical translation. 3) Needed to include the full Catholic Canon. The only real option is the NRSV. I wonder why English was the language used for this monumental opus instead of a more timeless and universal one such as Latin and/or Greek? The use of English made this Bible a product by- and for- the contemporary Anglo-Saxon world. However, this Bible, unlike an ephemeral paperback edition, is intended to last for millennia. The English language is so rapidly evolving and fragmenting that it will very likely be incomprehensible to future generations, negating the value of the materials and workmanship invested in it. By using Latin or Greek, this Bible could have been at the same time a contemporary achievement for the whole of humanity and a timeless one treasured through the centuries. On second thought, I think that if the creators insisted on using English, they missed a unique opportunity to make this Bible a “Rosetta Stone” that documents for posterity the English spoken by its makers at the dawn of the third millennium. Thank you for a great article. 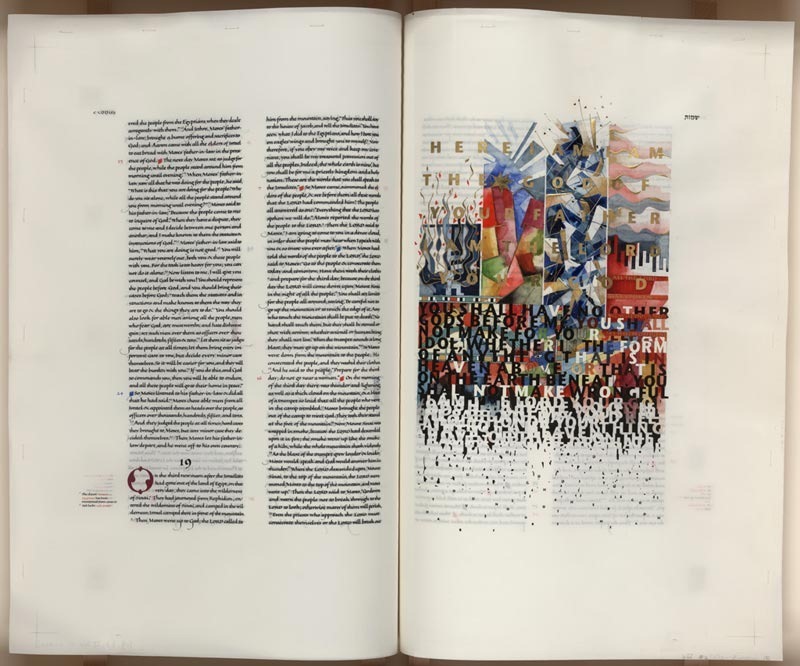 The St John’s Bible Heritage Edition opened for exhibition in Moorhead at the Hjemkomst last night and it is stunning! A great work of art and faith for this age. It’s produced by English speaking people, for English speaking people, so that today’s English speakers can read it. It was translated FROM Hebrew, Latin, and Greek. Why return it to the archaic languages? Yes, English evolves, and two centuries from now today’s English may be as “incomprehensible” to the future as 17th Century English is to us. But it isn’t really, is it? Latin, Greek, and Hebrew are incomprehensible now, to the audience the book is intended to reach. Paul, above, is on the mark with his analysis. Why the NAS Catholic Edition? May I add — because the sponsor of the book, Saint John’s Abbey, is in America; and Benedictine Monks are Catholic. Yvonne Carr, you’re talking about the wrong thing – this is a 21st century creation.